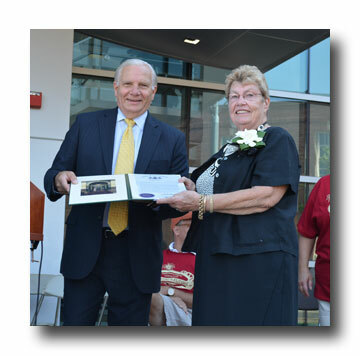 Senator Mensch presented Margie Booz with the 2016 Lifetime Achievement Award at Lansdale Founder’s Day on August 27. The traditional method of budget development, which relies upon incremental adjustments to expenditures made in the previous financial period, insulates governmental activities from the thorough fiscal review expected by taxpaying citizens. New and changing demands for public services are met through excessive budget growth rather than by pruning obsolete programs and redirecting existing funds. Some government programs were established so long ago that the original statutory basis has either been forgotten or is out of date. In time, the budget is driven by inertia rather than by clear and defensible purposes. I have introduced Senate Bill 1341 which calls for Performance Based Budgeting in our government. This is an effective method to counter the tendency toward perpetuation of outmoded state programs. SB 1341 would create a performance-based budget board to review the performance-based budget plans of Pennsylvania agencies and make recommendations on how each agency’s programs may be made more transparent, effective, and efficient. A Joint Appropriations/Policy committee hearing will be held on September 20, 2016 to discuss SB 1341. National, state and local experts, along with representatives from the Independent Fiscal Office and the Governor’s Budget Office, will present their experiences with performance measures and how performance management can aid in decision making. Click here for more information on SB 1341 and the upcoming hearing. Every month, the Senate Appropriations Committee sends out a monthly report on the status of Pennsylvania’s budget, spending, revenue, and more. This month’s report indicates the total general fund revenue for July 2016 was $1.973 billion, $162 million, or 7.6%, less than July 2015. However, July 2015 General Fund revenues included Personal Income Tax (PIT) withholding deposits from five Wednesdays, while there were only four Wednesdays in July 2016. Each Wednesday PIT collection day is work approximately $110 million. In addition, this report highlights the 2016-17 spending plan which does not include any broad-based tax increases, the 2016-17 revenue plan, general fund revenue detail and more. Montgomery County veterans and their families are invited to attend my joint Veteran ID event with Representative Justin Simmons onFriday, September 16, 2016 from 10 a.m. to 3 p.m. at our Red Hill office located at 56 West Fourth Street, Floor 2, Red Hill, 18076. The office is located on the second floor of the Red Hill Borough building. 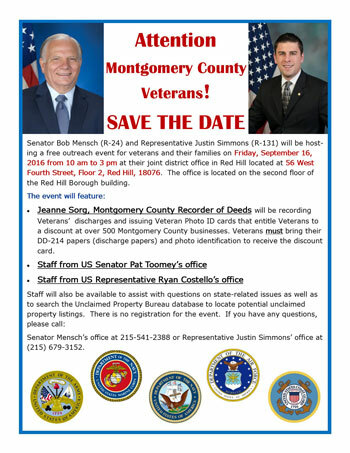 Montgomery County Recorder of Deeds Jeanne Sorg will be recording Veterans’ discharges and issuing Veteran Photo ID cards that entitle Veterans to a discount at over 500 Montgomery County businesses. Veterans must bring their DD-214 papers (discharge papers) and photo identification to receive the discount card. Staff will also be available to assist with questions on state-related issues as well as to search the Unclaimed Property Bureau database to locate potential unclaimed property listings. There is no registration for the event. If you have any questions, please call Senator Mensch’s office at 215-541-2388 or Representative Justin Simmons’ office at (215) 679-3152. To ensure that we are able to serve as many constituents as possible, we cannot accept paper from businesses or commercial entities. Households are welcome to bring up to six bags of paper to be shredded. 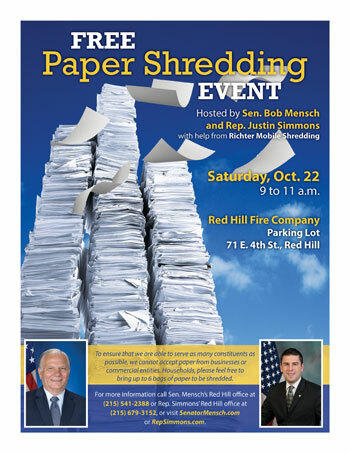 This month’s Mensch Report features another Constituent Service announcement focusing on the PA 1000. The PA 1000 is a Property Tax/Rent Rebate program that benefits eligible Pennsylvanians age 65 and older; widows and widowers age 50 and older; and people with disabilities age 18 and older. I encourage you to watch the show. Please do not hesitate to contact my office for the form and/or assistance completing the application. The deadline to submit this application is December 31. 2016. The Pennsylvania Department of Transportation (PennDOT) announced that lane restrictions are scheduled over the next month on Meyers Road between Seitz Road and Mill Road in Perkiomen Township, Montgomery County for utility relocation and excavation. Crews will work weekdays from 9 a.m. to 3 p.m. through mid-September. This preliminary work is part of PennDOT’s $11 million project to improve travel and safety at the intersections of Plank Road/Route 29 (Gravel Pike)/Otts Road and Meyers Road/Seitz Road/Township Line Road in Skippack, Perkiomen and Limerick Townships, Montgomery County. The improvements include widening the intersection of Route 73 (Skippack Pike) and Plank Road to include left turn lanes on both roads; relocating Otts Road to align with Plank Road at Route 29 (Gravel Pike) to create a four-leg intersection; adding left turn lanes on Route 29 (Gravel Pike) at Plank Road/Otts Road; adding left turn lanes on Plank Road and Otts Road at Route 29 (Gravel Pike); realigning Meyers Road to intersect with Township Line Road; realigning Seitz Road to form a T-intersection with Meyers Road; installing new traffic signals along the project corridor; and improving the roadway alignment in three locations. During construction, detours will be in place at times for closures of Plank Road, Otts Road and Seitz Road. One directional closures will occur on Route 29 (Gravel Pike). The project’s traffic control plan was developed in concert with the Route 73 (Skippack Pike) bridge project because Plank Road and Route 29 (Gravel Pike) are part of the Route 73 (Skippack Pike) bridge detour. Route 73 (Skippack Pike) bridge construction began on April 25, 2016, and will finish in late December 2016. The Pennsylvania Department of Revenue has launched an important new tool that will help businesses and tax practitioners. The business tax system known as e-TIDES is now offering a Statement of Account electronically. No longer do you have to get a print statement in the mail. You can view this brief video to learn more. The Pennsylvania Homecare Association (PHA) and homecare agencies across the state are joining home-based care providers across the country to participate in Bring the Vote Home, a national initiative designed to help seniors and people with disabilities who may have difficulty traveling to the polls register to vote and cast their ballots in the November election. Member agencies will be conducting voter drives among their staff, patients and consumers. Caregivers will assist patients and their families in registering to vote or in applying for absentee ballots. In addition, PHA is polling all Pennsylvania Congressional candidates and candidates for the Pennsylvania Senate to learn their position on home-based care for seniors and people with disabilities. All responses will be compiled into a Voter Guide that will be distributed to homecare professionals, patients, consumers and families across the state this fall. Pennsylvania’s homecare community brings care and services into the homes of more than 575,000 seniors and people with disabilities – a number that is growing each year as people live longer. Homecare is a lifeline, providing everything from medical care to assistance with activities of daily living like bathing and grooming. And now, homecare will provide a voice to these patients and consumers. The Big-Buck Trail Cam Photo Contest is now underway, according to the Pennsylvania Game Commission (PGC). Gather your best summer and fall big-buck, white-tail, trail cam photos for consideration. Beginning September 1, the PGC will select from a number of white-tail, trail cam photo entries to be released on its Facebook page for users to pick a monthly winner, with an eye toward selecting one overall victor on December 5, the conclusion of the Big-Buck Photo Contest. Monthly submissions should be sent to PGCtrailcam@pa.gov. Include the photographer’s first and last name, hometown, and county where the photo was captured. Photographers agree to the PGC’s use of the photos. Along with a photo assuming a spot on the PGC’s Facebook page, the monthly and the overall winners, selected by Facebook users, will each win a new trail cam to continue capturing the wondrous sights of wildlife in Penn’s Woods. The Get Smart about Antibiotic Resistance Program is a cooperative effort between the Pennsylvania Department of Health, the University of Pennsylvania and the Centers for Disease Control recognizing the more than two million Americans who annually experience complications from antibiotic resistance (ABR). A shot of creativity could land your child in the program’s winner’s circle. Your youngster can paint a picture, design a poster, develop a comic book, create a new superhero, or write a story or a poem about keeping healthy. Enter by the 10 p.m. October 31 deadline for a chance to see your child’s winning entry displayed on the Get Smart website. The Montgomery County Health Department offers two nurse-home visiting programs to pregnant women, new mothers, new fathers and their babies who might want a little extra help. They are: the Nurse-Family Partnership (NFP) program and the Maternal-Child Health Home Visiting program, also known as the Title V program. Both programs are for Montgomery County residents and are free. Who is Eligible to Enroll in the NFP Program? View more information on the Nurse-Family Partnership program. Who can enroll in the Maternal-Child Home Visiting program? To make a referral to either the NFP Program or the Maternal-Child Health Home Visiting Program, please complete this Referral Form and submit it to the appropriate contact listed on the form. For more information on parent and infant resources in Montgomery County, check out the Montgomery County Parent and Infant Resource Guide or call Ailene Keys, Maternal Child Health Program Coordinator, at 610-278-5117.